I don’t know how I can convey to you in a mere five minutes the hopes and dreams of a whole town trying to stop their beloved heart space being sent to the bulldozers. This is the moment, this is the day that the Roundhouse could be lost. You are being asked to approve the agreement with the Country Club. However in doing so, as the summary of the Report clearly states, Council will then go to tender for the development. In the 1988 Byron Shire Local Environment Plan the Roundhouse site was zoned by Council as “Special Uses 5a – Community Purposes”. This led the community to believe Council was going to acquire the site for community purposes. RAG and OSCA surveyed a sample of 850 local residents on their preferred use of the Roundhouse site. 97% wanted it for public use, mainly for cultural use. 3% wanted a subdivision so that the money could be spent on filling in potholes. I have been asked to remind Councillors that you promised to keep the Roundhouse in public hands and not develop it for sale as residential lots. And you did promise this at the Ocean Shores community centre before the elections . Many people rejoiced at your words, but some were cynical that politicians would not keep their word. The alternatives are: a subdivision of at least 18 high rise dual occupancy buildings forever on the Roundhouse knoll ridgeline. Or, a council community long term project, with a self sustaining cultural facility, supported by most of the residents of this shire. The Roundhouse would be a visitor attractant, and inject sorely needed employment and income earning opportunities into the town and shire. On behalf of the Ocean Shores and district community I am asking you to approve whatever you need to approve regarding the Country Club easements, but at the same time, stop the tenders being called. Considerable pressure appears to be on councillors to accept the Roundhouse subdivision as the quickest means of urgently gaining extra revenue. This is lazy and misleading. Councillors have been requesting a list of other saleable sites for at least ten years. There are other Council sites especially at Byron Bay that can be sold without the risk of having to borrow beyond Council’s capability. The 2013/14 Budget seems to indicate that Council is not sustainable and will not be able to borrow capital for the Roundhouse subdivision. How much money is the development going to cost? And how much will Council have to borrow? Council’s draft 2013/14 Budget lists Roundhouse Development Costs as $1,354,200 allocated to the 2012/13 year and a carryover of $1,273,400 into the 2013/14 year which we presume is the extent of the projected borrowings less the $90,000 Roundhouse borrowings cash deposit council had to take from the 2012/13 budget to obtain a small surplus. The figures in the 2013/2014 Budget need clarification for the community. What do they mean? Have the borrowings of $1,273,400 been the result of a revised business plan, less the $227,000 lost from the Country Club withdrawal. Would this yield a quick return? Would the borrowings have to be repaid quickly and upfront, or is this a long term loan? Is Council now borrowing 100% of the development costs? Is Council meeting the debt servicing ratio for this? Council has not addressed the reported difficulty of the contaminated site. Unless this is done, who will risk buying any Roundhouse land? Is this risky project really going to give Council a quick return of its investment, or yield the $2 million windfall it thinks is coming? Because of the risk, and Councils poor financial status, should the Roundhouse borrowings now come under S23A of the Local Government Act which includes Council’s obligation to carry out a Capital Expenditure Review and notify the Division of Local Government? Have Councillors been briefed on this possibility? There has been a blow out of development costs from the original 2001 business plan. This alone means referring under S23A to the Division of Local Government. 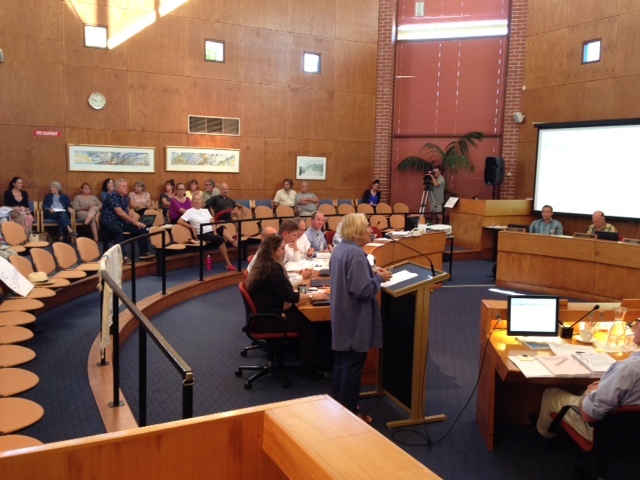 By Council resolution, lots 10 and 11 fronting Orana Road will be set aside. So the net yield to council will be for only 9 lots. Has this been factored into the Roundhouse profit estimates? Section 23A of the Local Government Act Clause 8 states: “Councils have a responsibility to their community for the prudent management of community assets and finances.” The community expects Councillors to be fully briefed on the financial implications of the risk venture of the Roundhouse subdivision before allowing tenders to be called. The contaminated well on Lot 9 of the subdivision. EPA water tests show water contamination levels at a depth of 8 metres exceeding guidelines. Elements present include phosphorous, vanadium, manganese, aluminium and iron. No soil testing has been done. Will people buy land with possible contamination issues? Since July 1 2012 OSCA has been running a successful community pop up gallery at Ocean Shores, which demonstrates the great need for a public showcase for our creative arts. The current exhibition is Council’s Youth Art Project. Byron Shire does not have a permanent public gallery. OSCA has a dream of moving the gallery to a demountable building on the Roundhouse site. This would get things started. The Roundhouse site is heritage listed in Schedule 5 of the new draft LEP. Many residents would like to donate archival material to preserve the town’s history. Harry Boyd, the Ngargwal Durungbul custodian of the Ocean Shores to Tweed Nerang areas fully supports a cultural centre on the Roundhouse site. He wants to write a history of his people, with the support of the Ocean Shores Historical Society and based at the Roundhouse cultural centre. We need a Project Reference Group or some other format to discuss all the issues. Council could then work with RAG and OSCA, with the Ngargwal and other community groups. Thank you Jan for caring for our community and representing all of us who are unable to be with you at council today. Councillors debated the priorities of raising financial capital for debt and infrastructure needs versus costly “dreams” based in social needs. They then unanimously voted to sell the entire Roundhouse site, including the 2 lots which were previously reserved for possible community use. Item 10 in the agreement will give consideration of infrastructure needs in the North of the Shire, if funds are raised beyond the costs from these asset sales. Correction: CLR Chris Cubis voted against (due to poor settlement strategy in the North).